A special issue of the peer-reviewed journal Trends in Hearing, dedicated to Macquarie University’s Australian Hearing Hub (AHH), was published today. The issue showcases an array of collaborative research from the Australian Hearing Hub, adding a wealth of new findings to the fields of hearing and audiology. Professor David McAlpine, Macquarie University’s Director of Hearing Research, in his accompanying editorial for the special issue, praised the Hub for its exemplary collaborative approach towards research and the delivery of clinical solutions. The six peer-reviewed research papers being published as part of the special issue address various aspects of hearing and hearing healthcare, including links between hearing and mental health, hearing implants, listening effort and decision-making processes in hearing health professionals. Listed below are the main findings, in brief, of the six studies featured in the special edition. While the researchers haven’t yet pinned down whether this means that people with hearing loss are more likely to get depressed, or if depressed people are more likely to perceive that they have problems with their hearing, it is important that those in this age group, and their audiologists, are aware of the link. The authors of the study suggest that people in this age group should seek intervention early, for hearing loss, depression or both. Keidser G, Seeto M (2017) The influence of social interaction and physical health on the association between hearing and depression with age and gender. Trends in Hearing. July 2017. Children with a hearing device who develop good language ability but struggle to listen and communicate, are at greater risk of developing psychosocial problems, such as problems with personal relationships, work, or school. The authors of the study suggest that new interventions need to be developed that focus on improving early social skills for this group of children, as well as improving their ability to listen and communicate at a functional level, to enhance their well-being. Wong CL, Ching TYC, Cupples L, Button L, Leigh G, Marnane V, Whitfield J, Gunnourie M and Martin L (2017) Psychosocial Development in 5-year-old Children with Hearing Loss using Hearing aids or Cochlear Implants. Trends in Hearing. July 2017. 85 per cent of people who require cochlear reimplantation – a replacement of their damaged cochlear implant via surgery – regain similar speech recognition score to what they had before the damage. The findings indicate that cochlear reimplantation, when required, helps to improve or maintain a person’s hearing health in the vast majority of cases. Reis M, Boisvert I, Looi V and da Cruz M (2017) Speech recognition outcomes after cochlear reimplantation surgery. Trends in Hearing. July 2017. Researchers have uncovered that the measurable signs of listening effort – pupil dilation and an alpha power change in our brainwaves – may be tapping into separate processes. 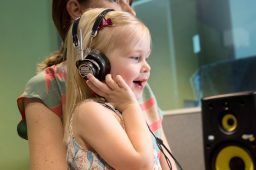 The research aims to objectively measure listening effort, which is particularly important for hearing impaired children, who may not be able to articulate their listening effort themselves. It’s hoped that by identifying what leads to effortful listening, further health risks such as stress and fatigue, could be prevented by determining the most appropriate intervention. Miles K, McMahon CM, Boisvert I, Ibrahim R, de Lissa P, Graham P and Lyxell B (2017) Objective assessment of listening effort: co-registration of pupillometry and EEg. Trends in Hearing. July 2017. This study found that audiologists tend to rank clinical test results and client preferences as the most important factors in their decision-making process when it comes to patient care. Many also said that discussion with colleagues was important in the decision process, whereas information shared at conferences was not as useful to audiologists. Boisvert I, Clemesha J, Lundmark E, Crome E, Barr C and McMahon CM (2017) Decision-making in audiology; balancing evidence-based practice and patient-centered care. Trends in Hearing. July 2017. People who have two cochlear implants, as opposed to just one, can locate the direction of speech and follow a conversation in background chatter with more ease, this study has found. The findings indicate that someone with two cochlear implants is more likely to have an easier time in real-life situations where they are surrounded by multiple sound sources or want to participate in a conversation with multiple people at once. Rana B, Buchholtz J, Morgan C, Sharma M, Weller T, Appaiah-Konganda S, Shirai K and Kawano A (2017) Bilateral versus unilateral cochlear implantation in adult listeners: speech-on-speech masking and multi-talker localization. Trends in Hearing. July 2017. The Australian Hearing Hub, an initiative of Macquarie University and the Australian Government, provided financial support for the publication of this special edition.